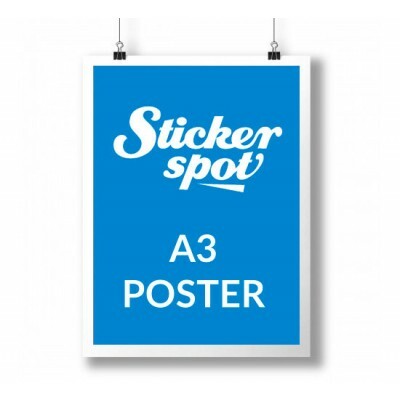 Stickerspot print large posters, from A3 to A0 Size, (and any custom size inbetween). We can print from one poster to thousands. Just select the quantity you need and upload your high resolution print ready artwork. PDF files are best. Posters are ideal for bands, business, events, trade shows and in-store graphics. Printed A3 Poster Size: 297 x 420mm A3 Printed 1 Side, Full Colour Print Paper .. Printed A2 Poster Size: 420 x 594mm A3 Printed 1 Side, Full Colour Print P.. Printed A3 Poster Size: 297 x 420mm A3 Printed 2 Sides, Full Colour Print Paper.. Printed A1 Poster Size: 594 x 841mm A1 Printed 1 Side, Full Colour Print .. Printed A0 Poster Size: 841 x 1189mm A3 Printed 1 Side, Full Colour Print Paper..